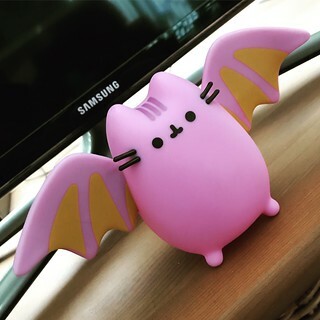 Day 28 – Halloween is coming! Halloween is three days away and, as of this morning, what you see in the above photo was the extent of my 2017 decorating endeavors. Pathetic! Honestly, I haven’t been able to enjoy October as much as I’d like so far. It’s been a busy month at work, race season and training are kicking into high gear, and my Whole30-ish diet has been sucking up every remaining free moment. There just hasn’t been enough down time for me to relish the holiday season. Along those lines, I was supposed to go to work for a while this afternoon after running with my Galloway group and then picking up my bib for the Rock ‘n’ Roll Los Angeles half marathon at the convention center (in dreaded downtown LA) this morning. But after I got home, showered, and started doing some of the usual weekend chores around the house, the day pretty much got away from me and it was 5 PM before I even thought about work. And then it was time to watch Game 4 of the World Series! So I decided to stay home for the rest of the day and decorate my house for Halloween. Right now I’m sitting on my couch, watching the Dodgers and Astros, and basking in the glow of my jack-o’-lanterns. The perfect late October night, especially with the blessedly cool weather. Work will have to wait until at least tomorrow. But then, in addition to the half marathon in the morning, I have to make a pot of chili for our annual chili cook-off at work on Tuesday. I did a lot of prep today, including slow cooking a pork roast (I’m trying something different this year), but it will still take at least a couple of hours to complete the process tomorrow afternoon or evening. Let’s just say it’s going to be a busy day. 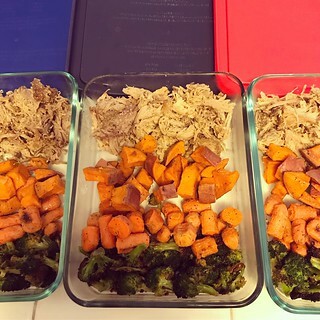 Speaking of cooking, I did quite a bit of it today – broccoli, carrots, and sweet potatoes – all healthy components of the meals I’ve been eating this month. It’s funny to be making so much food when my vacation starts on Wednesday (I’ll write more about that later), but I needed to make a lunch for Monday, and then the rest is going into the freezer for when I get back. Having diet-friendly foods at my fingertips will make it easier to avoid the pitfall of fast food as soon as I get back to Los Angeles. Just so you know, today is another one of those days where I won’t be sharing my meals. It’s safe to say that I ate more than my fair share of carbs (mostly in the form of bread) in preparation for the half marathon tomorrow morning. I felt pretty terrible running only three miles today with my group so I knew I needed more energy to run 13.1 miles tomorrow. Let’s hope it works! It’s finally Friday and I couldn’t be happier. This week has been long and stressful. Working the 5 AM to 2 PM shift at work makes eating, sleeping, and exercising difficult, and the heat wave made everything nearly unbearable. Luckily the weather has cooled down to almost fall-like levels just in time for the weekend. Today’s high was more than 30 deg cooler than it was on Tuesday and it felt like heaven. I ran 5 miles tonight and I realized that this will probably be one of the last times I wear my running shorts this year. (Although I’ll probably need them in Florida next week, but that’s another story.) At least I hope I’m right about that. Right now I’m watching Game 3 of the World Series and the Dodgers are struggling. I’m sacrificing watching tonight’s episode of “Once Upon A Time” (still my favorite show) to watch baseball. Thank goodness for DVRs. It’s getting late and I still have to wash some dishes tonight (lots of cooking = so many dishes), but then I need to get ready for my Galloway group run tomorrow morning. My weekend is going to be extremely busy, but I can sleep in until 6 AM tomorrow! What a treat! As far as meals go this week, we had catered food at work everyday due to a big event that was happening. However, the food came from our on-site cafeteria so that probably sounds better than it actually was. But when you’re tired and stressed, like I was all week, it was very difficult to avoid the foods I’m not supposed to be eating this month. Like garlic bread sticks and chocolate chip cookies. But by some miracle I managed to stick to my diet except for the one morning I woke up late and had to resort to eating a cafeteria breakfast sandwich because I didn’t have time to make anything at home. Other than that I successfully brought my own delicious, Whole30 compliant breakfasts and lunches with me to work. Not too shabby. The end of this 30-day diet experiment is almost here and I want to finish it as strong as I can. (Except for tomorrow when I’m going to eat a lot of carbs in preparation for the Rock N Roll Los Angeles half marathon on Sunday morning.) Three more days! It’s Thursday night and I have dishes that need to be washed, laundry that needs to be folded, and a tomorrow’s lunch that needs to me made, but instead I’m here I am on my couch watching “Star Trek: Discovery.” This show annoys me, but not in the way you might think. As a huge Trekkie I was thrilled to hear that a new series was in development. It seems like forever since “Enterprise” was on TV and, except for the new movies that basically rewrote the original timeline, that was the last taste of Star Trek that we’ve had since 2005. I have I admit that there is already an abundance of fantastic television shows for nerds like me these days, so much so that I can’t keep up with all of the series I’d like to. I’ve tried really hard not to add any more shows to my “must watch” list this year, but for new Star Trek programming I’ll make an exception. 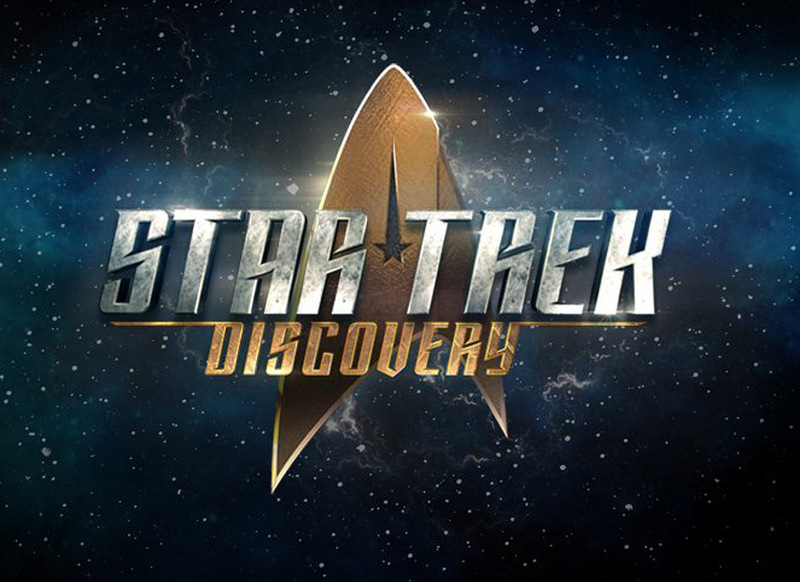 But then came the unfortunate news that with the exception of the premiere episode, “Discovery” would be available only through the CBS All Access app and that viewers would be charged to stream the episodes. So frustrating! At first I declared that I would never pay to watch a show, even of the Star Trek variety, when cable already has so many great ones that don’t cost me anything extra. However, I still DVRed the first episode of “Discovery” when it aired on CBS on September 24th. Much to my chagrin I LOVED IT. Compelling female protagonists, cool spaceships, an exiting story, and crazy plot twists – what’s not to love? So I grudgingly signed up for a CBS All Access account so I could watch the rest of the series. Every week since then I’ve been equally captivated and annoyed because this is such an amazing show. It’s everything I wanted new Star Trek to be, but I hated having to pay for it! As much as I hate shelling out an extra $5.99 per month, it’s money well spent for this level of entertainment. So this overwrought explanation leads me to tonight, watching “Star Trek: Discovery” (and then “After Trek” with Matt Mira) on my iPad while writing this blog post when I should be getting ready for bed. Not only money well spent, but time well spent (even if I know I won’t get enough sleep before my 5 AM shift at work tomorrow). Yesterday evening I watched a lot of TV because it was too hot to do anything that required me to peel myself off the couch. Notably, I watched the second half of Game 1 of the World Series (I managed to nap through the first half) between the LA Dodgers and the Houston Astros. Luckily for my fair city, the Dodgers pulled off a win in this hellish heat wave. 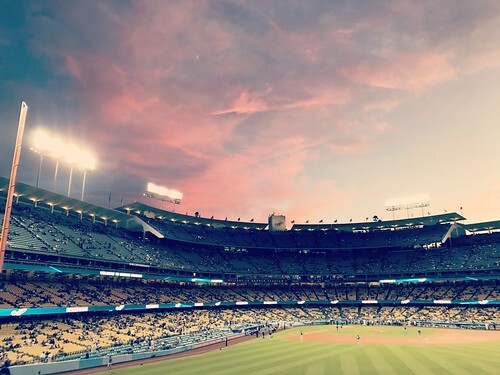 I actually went to a Dodger game with some co-workers back on September 25th. Ironically it was much cooler there a month ago than it is now (although today’s high was blessedly 10 deg cooler than yesterday). I’m definitely a baseball fan, but the reason my co-workers and I made the long trek up to Elysian Park, which took us about an hour and a half in rush hour traffic, was for Hello Kitty night. Not only did we get a cute Hello Kitty tote bag, but we also had seats in the all-you-can-eat section which offered unlimited hot dogs, drinks, and other ballpark snacks. My stomach didn’t thank me for eating all of that stuff, but watching the game was still a good time. And we saw a beautiful sunset too, as you can see in the above photo. So while I can’t say that I’m a huge Dodgers fan (or Angels either, while we’re at it), I’m rooting for them to win the World Series this year. If nothing else it will make for some entertaining television over the next week. Regarding my breakfast today, I overslept this morning and didn’t have time to make anything before I left for work. I did manage to grab a banana on my way out the door (which I’m calling snack #1 of the day), but it wasn’t enough. So when our catered breakfast showed up at 6:30 AM my growling stomach caused me to be weak and take a breakfast sandwich. I intended to eat only the eggs, sausage, and cheese portion of the sandwich, but then I started on the buttery biscuit. It was mostly stress eating considering I had a backlog of work to do as soon as I arrived at 5 AM and no one to help me with it, but that’s no excuse for eating crappy food. Fortunately I got halfway through the biscuit, realized it wasn’t worth the calories, and threw out the rest. The good news is that the breakfast sandwich kept me full enough to avoid another snack before lunchtime. So maybe a small win? That’s how I’m thinking about it. It’s hot, y’all. Halloween is one week away and it feels like July. 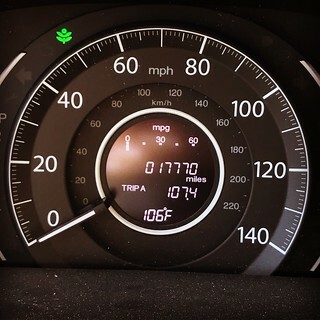 I ran a couple of errands after work and as I was driving home my car told me it was 106 deg outside. Holy crap. And let’s remember that I DON’T HAVE AIR CONDITIONING AT HOME! I am so over summer. It’s almost Halloween and it feels like an oven in Los Angeles. So wrong on so many levels. I went to boot camp yesterday and it was 86 deg inside the gym. Luckily it was a strength day rather than a cardio day so it wasn’t too terrible. Today’s classes were cancelled due to the heat, however, and going for a run was definitely out of the question. I’d have keeled over after a quarter mile. I wanted to take a walk around the neighborhood tonight, but it’s still so hot outside! I’m currently holed up inside my house with all of the windows closed, eating a salad (a cold dinner was really the only sane choice), and trying to not to move too much or I’ll start sweating. I’m also watching Game 1 of the World Series which broke a record for the hottest post season game ever with a temperature of 103 deg at Dodger Stadium for the first pitch. It’s supposed to be cooler tomorrow, but the definition of “cooler” is a high in the mid-90’s rather than triple digits. Sheesh. This is making me hate October! I originally thought I had to be at work at 7 AM tomorrow to start my shift, but I was wrong. It’s 5 AM instead! That means I need to scarf down my dinner, take a shower, and go to bed as quickly as possible. Unfortunately we’re in the midst of a heat wave and it’s pretty hot inside my house. Not as hot as it’s going to be tomorrow, but I’m trying not to think about that right now. Sleeping when it’s over 80 deg inside is very uncomfortable. And I wouldn’t recommend eating chili for dinner on a hot day, but I had one last serving in my fridge that really needed to be eaten or go to waste. Luckily it’s delicious so it’s not a huge sacrifice. Speaking of delicious food, I tried the acorn squash casserole today and I am happy to report that it’s amazing! Due to my early shift start time I wasn’t hungry enough to make scrambled eggs before I left the house this morning. So instead I put some squash casserole in a little container so I could heat it up at work, and threw some sliced hot dog on top. It was perfect. I already made another serving for tomorrow. Who wants to cook eggs at 4 AM anyway? This past January I ran the Walt Disney World Marathon. 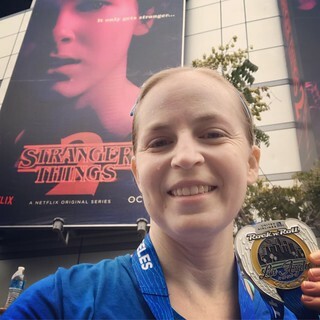 It was my very first marathon and it was really rough (many thanks to my friend Missy for getting me through it), but I was thrilled when I crossed that finish line. Shortly afterwards I was emboldened by my success and possessed by the notion that I could tackle an even bigger challenge in the future. And I’m not talking about the four marathons in a year that I did in 2017. No, I had something even crazier in mind. So it wasn’t long after the WDW marathon that I registered for the Dopey Challenge in January 2018. This challenge consists of running the Disney World 5K, 10K, half marathon, and full marathon on four consecutive days. Sounds ludicrous, right? Well, it’s absolutely insane, and ten months later I’m not quite sure why I signed up in the first place. But now that January is fast approaching I’m committed to conquering these races. It’s not going to be easy, but I’ll give it everything I have. This weekend I picked up with the Galloway training plan for the Dopey Challenge. I’m actually one week behind because I didn’t want to run too much the weekend after the Long Beach Marathon, and now I’m making up some of the mileage. This training plan is different from the one for just a marathon because it calls for many weekends of Saturday and Sunday running to build up endurance and prepare you for long distances multiple days in a row. 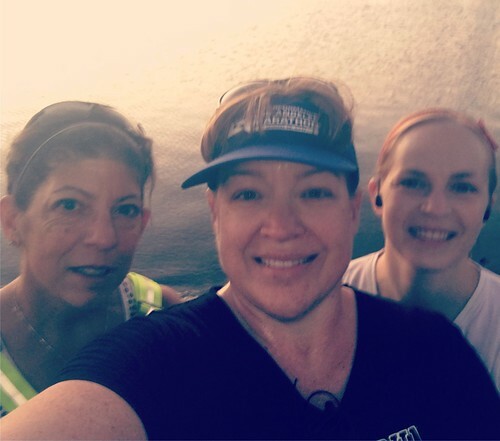 So I ran 7 miles around my neighborhood yesterday morning, and then 17 miles this morning with a couple of my running buddies who were kind enough to get up long before the crack of dawn to accompany me. Due to the unseasonably warm weather this late in the year (it’s going to be over 100 deg at the beach for the next two days) we started our journey at 5 AM to avoid the worst of it. And luckily we succeeded. The above photo was taken mid-run when we stopped to admire the sunrise at 7 AM. It was lovely. I’m very happy to be back on track with my training for the Dopey Challenge. I know it will be incredibly demanding, but that means I’ll be even more proud when I succeed. P.S. I’m not posting my meals again today because not only did I have two packages of Sports Beans and two 10-oz bottles of Pedialyte while running, I ate whatever sounded good after I got home. I’m almost positive that my carb-fest yesterday is the reason I didn’t feel like I was dying during my long run this morning. Despite eating sweet potatoes and plenty of fruit, I’m afraid the restrictions of Whole30 are just not providing my body enough fuel for my athletic pursuits. However, I am going to do my best to finish this 30-day diet as faithfully as I can. I’ll let you know how it goes! As I’ve mentioned before, my fridge and freezer are pretty full of food that I’ve cooked on previous weekends while watching Florida football. But there was no Gator game today due to it being a bye week for Florida so my usual built-in excuse to hang around my kitchen and living room for four hours wasn’t available. I still wanted to do some cooking, though, even if it wasn’t strictly necessary for the purpose of feeding myself this week. 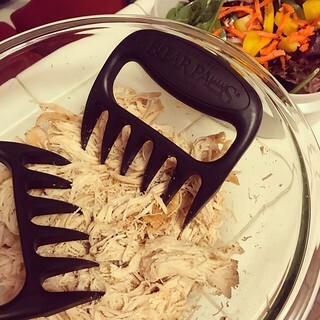 Before I started this Whole30-type diet I flipped through a bunch of Paleo cookbooks to see if there were any recipes there that looked appealing. One of the first ones that caught my eye was PaleOMG’s Stuffed Acorn Squash which was an intriguingly unique breakfast option. At this point I’d try anything that can free me from the endless cycle of scrambled eggs every morning. So this afternoon while watching some Halloween movies (Fun Size, Sleepy Hollow, and Addams Family) I whipped up the squash, sausage, and onion concoction. I actually used PaleOMG’s Pork Breakfast Sausage in the process as well. 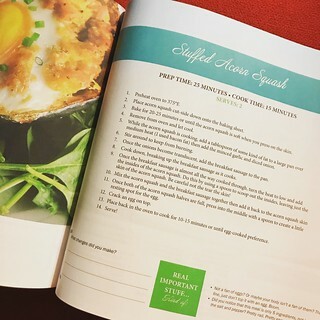 I did make a couple of changes – I ended up cooking the squash mixture in an 8×8″ square pan, casserole-style, and I skipped the egg on top before baking. 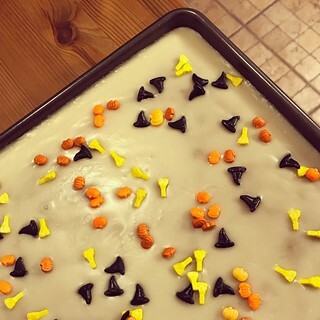 I only tried one bite so far, but it was really delicious. I think I’m in for a breakfast treat this week. P.S. I’m most definitely not posting my meals today. After feeling like I was going to die during my last couple of short training runs, including the one this morning, I decided I need to eat some serious carbs in preparation for my attempt at 17 miles tomorrow morning. I have indulged in many of my favorite foods today and it’s been glorious. I don’t intend to make this a habit, but if eating grains and sugar gives me the energy I need for running then I’m going to make that sacrifice!